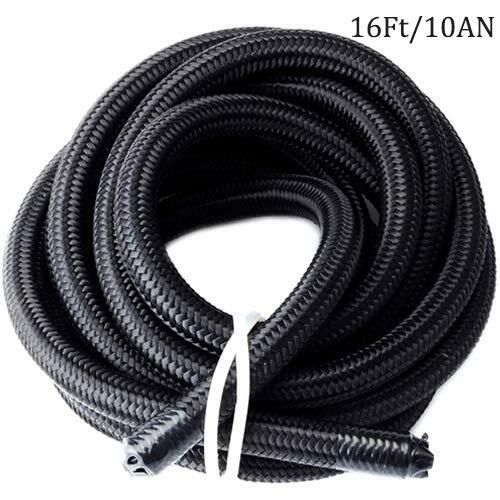 Constructions: Inner hose Materail: CPE Synthetic material hose,clean and fast flowing, provides constant flow during operation of the racing engine. Outside: coverd with high quality Nylon and stainless steel wires, achieving the desired flexibility and mechanical bond between the braiding layers, provides maximum pressure capabilities, while maintaining the beauty, and flexibility that is vital for the quality of High Performance Hose. Size: ID:0.56 inch OD:0.82inch.Measure before purchase. The Nylon material is flame retardancy. Perfect fit with our own 10AN Swivel Hose Fitting End.